[MAGS Entry Aug. 2017 - Theme: "The Bible"] Sometimes to get what you want, you have to break all the rules. And I DO mean all 10. Debra needs God's help, but she needs to get His attention. Has she taken it too far? This game has the interesting mission for the player and Deborah to break all 10 commandment in only one adventure game to get god's attention to find recently passed Timothy again. The graphic of the free game are not perfect but have their own charming style and some funny musical touches (the organ player!) lift up the mood. The puzzles are easy or trial and error somehow but overall the story and idea and the cool end make 10 Ways From Sunday a fun adventure gaming experience. Satan speaking: Although this game lacked in a few areas I found a certain charm to it. The game play was good and I like the voices. Graphics were so-so but passable and the puzzles well presented. Overall I enjoyed this game which HanaIndiana managed to complete in the said time. Great theme. At first, I was reminded of Four Last Things. Yet the game is entertaining on its own. The dubbing is a nice touch. I like how this game takes an idea from the bible and turns it on its head. The puzzles work nicely, even if some of them could be a bit more challenging, but it is a very ambitious game. The voice work also adds an extra layer. A very entertaining little game. This game was very charming to me. I think the soundtrack and voice work contributed a lot to that, but it also had some very cute graphics in a consistent style. The writing was a great combination of a matter-of-fact tone with occasional comedy that didn't seem overdone. Nice fun game. Very impressive for a MAGS game. For what the game lacks in visual beauty, it makes up for in a beastly storyline. 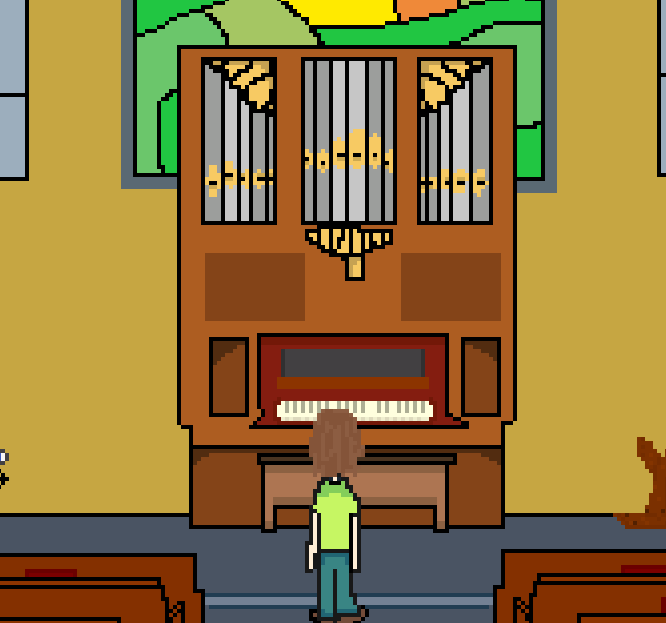 Throw in some voice-overs and some organ music, and you have yourself here a fun lil game.